Inclement weather couldn’t keep the crowd from enjoying the annual maple syrup festival at Greens’ Sugar Bush near Castalia over the weekend. The previous Sunday, March 31, the Green family served 1,059 people a hearty breakfast of pancakes, sausage and applesauce. Last Sunday, despite persistent rain showers, they served 1,092. 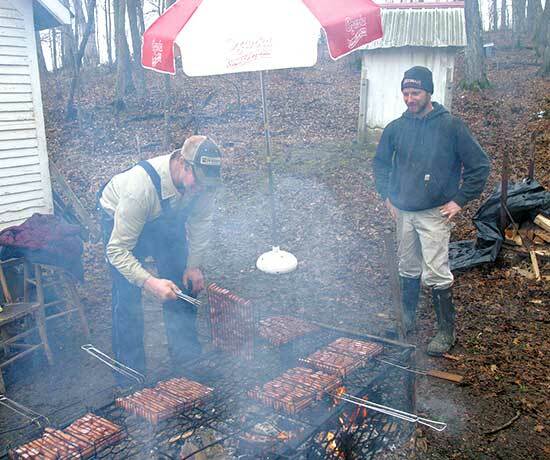 Above, Tom Melcher of Castalia, left, and Brian Melcher of Waukon, prepare sausage for the masses.